A recent case is offering clarity to employers who are forced to deal with violent or threatening staff. A long-term Toronto Transit Commission employee who was fired for uttering death threats has lost his bid for reinstatement. We wish this wasn’t so news-worthy, but it really is. The Grievor, Mark Davis, was a 54 year old fare collector with over 25 years of service as a member of the Amalgamated Transit Union who was terminated for just cause. Davis confided to a co-worker, Ms. Bethune, that he would be “the one” to kill TTC management employees, including three that he identified by name. The threats were apparently prompted by the fact that he had to attend sensitivity training the day before. Ironically, the sensitivity training was a condition of his reinstatement to work stemming from prior discipline for flipping off a rider. Ms. Bethune struggled with her decision to report Davis’ comments to management because, as she put it, “people don’t tell on other people” at the TTC, but ultimately was concerned enough to complete an incident report. The TTC investigated and eventually terminated Davis from employment. The Union filed a grievance on Davis’ behalf challenging the termination as unjust. … workplace violence, especially given its wide definition in the Occupational Health and Safety Act, does not automatically warrant the upholding of a discharge. As in all disciplinary cases … the arbitrator must consider all the circumstances, including the nature of the violence, its context, the grievor’s seniority and disciplinary history, the impact of the job loss on the grievor, and, above all, the prospects that the employment relationship can be rehabilitated and survive the grievor’s reinstatement. The arbitrator determined that the aggravating factors of this case outweighed the mitigating factors of Davis’ lengthy tenure and financial hardship following termination. In particular, the arbitrator was persuaded by the facts that Davis never acknowledged or admitted to making the threats, did not apologize for his behaviour, did not have a clean disciplinary record, appeared to have a problem with women in the workplace, and most troubling, that he made the threats only one day after having completed mandatory sensitivity training. Clearly the training that was meant to be rehabilitative, had no positive impact on the grievor. As a result, the grievance was dismissed and the termination was upheld. However, there are different considerations in the employment context compared with criminal or mental health situations, where release into the general society is the question in the assessment. In deciding on reinstatement to employment, the issue is whether a grievor such as Mr. Davis is to be put back into a situation where fellow employees have no choice but to interact with him. As such, the impact of threats on those other employees must be an important consideration. While I agree that Mr. Davis will likely never engage in physical violence, the three managers who were targets of his threats, as well as Ms. Bethune and all his other co-workers, deserve – and in fact have a legal right to – a workplace where they do not have to worry about the kind of threats made by Mr. Davis, even if they were idle. This decision helps us predict what level of discipline may be justified in different cases involving workplace violence. Where idle threats of violence are made by an employee with long service, a clean record of discipline, and who is likely to integrate back into the workplace cohesively, termination may not be justified. Instances of actual violence, or where employees will suffer from having the employee at work, are less likely to warrant any discipline less than termination. 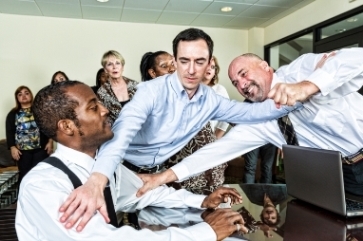 Workplace violence is still an emerging legal topic, and there are very few cut-and-dry instances where the appropriate level of discipline is obvious. The professionals at CCPartners have extensive experience with advising employers on discipline for workplace violence, including which factors to consider, and most importantly how to take diligent steps to ensure workplace safety. Click here for a list of our team members that can assist with all your labour relations questions.